This medium fine bone china jug is hand decorated in Staffordshire with the glorious Mosney Mill Bee and Flower design set on a white background. 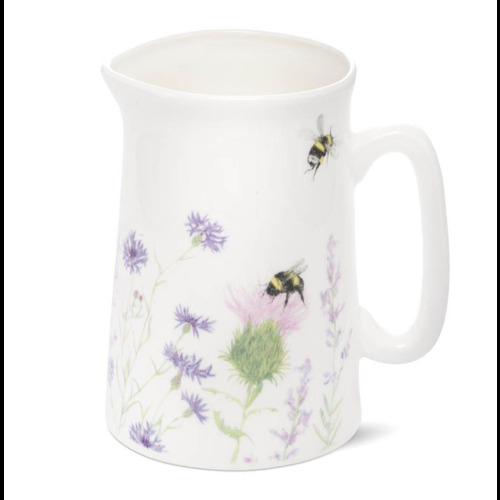 At 13.5cm tall with a 500ml capacity this jug is a great practical or decorative addition to any kitchen. Also available in small (12cm, 300ml capacity) and mini (7.5cm 140ml capacity) the set are a sight to behold. Whilst our china is dishwasher and microwave safe, we feel that it often benefits from a bit of TLC. We find a gentle wash in warm soapy water, followed by a rub dry with one of our equally lovely British made tea towels, is a much kinder way to look after fine china.